It’s a wonderful way to get to know a country, or even a route, by walking through it. Walking speed allows you to experience your surroundings at a sedate pace. The landscape unfolds gradually, mountains appear having been previously tucked behind another. 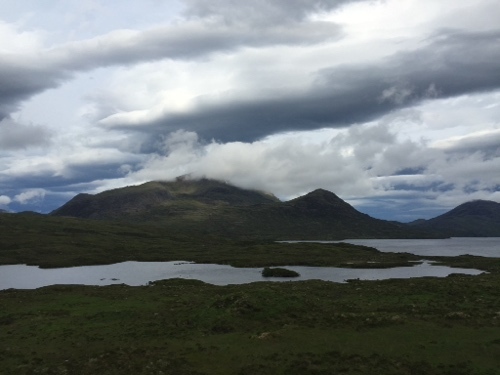 Lochs come into view by sheer surprise as a hill is crested, their waters long and thin, cupped between the surrounding slopes. Climbing up the side of mountains, it’s a guessing game as to when the summit will finally arrive but when it does, as if sensing my anticipation, the rewards are often majestic. Peaks stretch away to all points of the compass, sunlight dazzles and casts cloud shadows that race over the landscape. One aspect of nature up here worth watching is the escape of water. 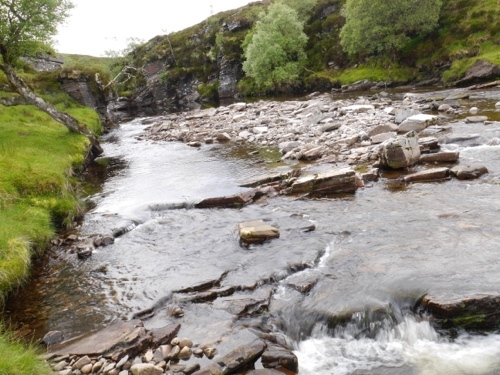 Countless trickles, streams, lochs and rivers all play their part in allowing the passage of water down to the ocean. It’s everywhere, an infinite amount seeking the easiest and quickest route, the path with the least resistance. And the mountains and glens have been shaped as it erodes, carves and chisels away at the rock. It can be heard whilst sitting on a patch of grass having lunch, unseen but somewhere trickling a passage. Joining a stream it builds in intensity, before spilling into the rivers, the real arteries. Look up at the rock faces around, especially after a storm, and streams of water cascade down, streaking the stone like tears. Countless lochs collect and scoop up these sources and for a time, hold onto a large part before releasing it to a river at the outlet. On windy days, not uncommon up here, white horses charge across the surface and walking beside them, the merest hint of a wave quietly laps the shore. But it’s the rivers that have caught me by surprise. So many rivers, impatiently cascading down valleys, racing towards the coast. The roar of some is deafening, crashing and foaming, racing over jagged rocks. They have carved valleys, gorges and whole landscapes. However, the true gift of this hike so far is the waterfalls. I understand now that in a landscape such as North West Scotland, these glorious displays of power are common, but it wasn’t a sight I had prepared myself for. The gorges impress the most. More often than not the water here has a dark brown tint picked up from the peaty soil but it’s gloriously clear. The difference of this brown hue with the white rage of an angry river is quite some contrast. Tall, white sheets of water falling over precipices and appearing almost to slow down as they plummet, in slow motion, to a waiting pools where the river carries on ever down. I peer over the edges of drops, stomach clenched, and hear the roar beneath me, seeing these torrents stopping at nothing in their journey. Scotland is renowned for being wet yes. I could be polite and temper the argument a little but it’s true, this corner of Great Britain gets a lot of rain. Having now walked through a good part of it, I have a new found respect for the beauty of what the journey of water up here offers a hiker. 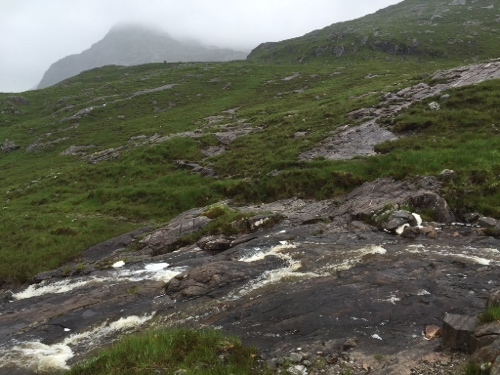 From Inverleal, where I last left you, the Cape Wrath Trail continued to provide a stern test. I’ll be honest, it’s caught me out. Alex Roddie has a lot to answer for, he walked and finished the route just before me and after a few beers in Durness listening to him, I nearly caught the bus out the following morning. 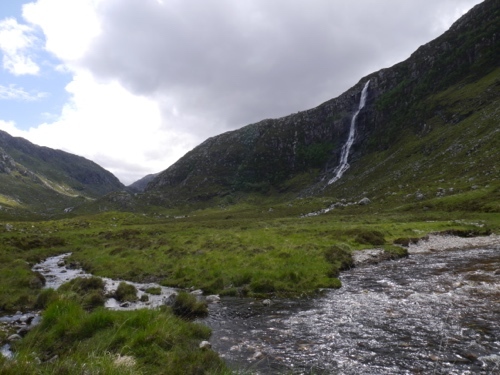 However, in order to experience this remote corner of Scotland, and to marvel at what it offers, a hiker needs to accept a certain amount of hardship. The rain, the terrain, the climbs, river crossings and the navigation are all a stern test. 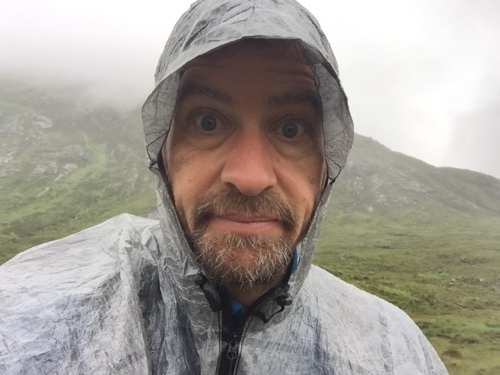 At times I’ve cursed it, climbing over a mountain with a howling gale smacking into one side, rain stinging, feet soaked, hands numb and with little clue to where I was going, I’d rather have been somewhere else. But get through it I did, and what I saw through those 240 miles amazed me. 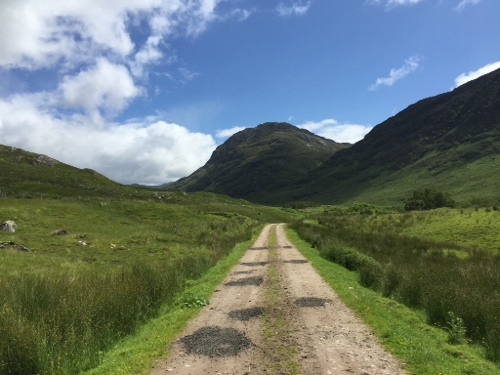 Lofty peaks hemming me in, forcing my route through a glen as I gaze up in awe at what is around me. Then, one valley spills out to another, a meeting place, a focal point where two, maybe three or four more join in the party. Stood motionless in the middle of inspiration, where peaks and valleys converge, I’ve tried to take it all in. It’s majestic beyond words, demanding a hiker just stops and admires, and even then I couldn’t believe what I was seeing. 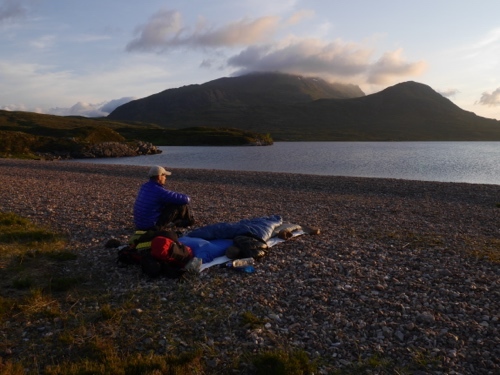 I think perhaps my best memory of The Cape Wrath Trail was Lochan Fada. Having stopped to chat to a mountain biker, he pointed out that I would be passing Lochan Nid, one of his favourite spots. I did indeed pass it but what I found further on was perhaps the highlight of the trip. I squelched through moss laden with water, stumbled over rocks and uneven ground before Lochan Fada suddenly appeared below me through the murk of cloud base. Reaching the shore I tried to erect my tent but a broken trekking pole scuppered my efforts. I’d normally just sleep on the ground but in Scotland it’s either rain or midges that usually put paid to that idea. However, the forecast looked promising until morning and a brisk wind chased of the insects. I was left on the shore, staring down the length of this body of water, the sun slowly gliding west and soon to disappear behind the peaks. Wind patterns flicked over the Loch and even at ten in the evening, there wasn’t even a hint of night approaching. So there I slept, sleeping fitfully as I kept waking to take in the view over and over again, I never tired of it. 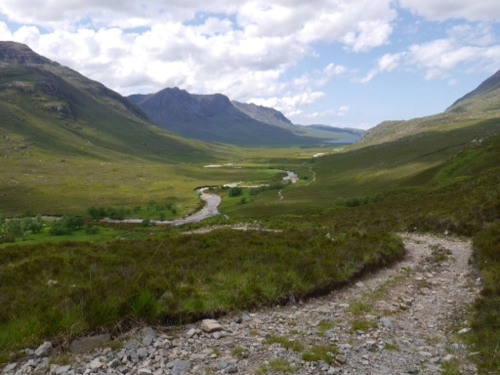 On day sixteen of my hike I emerged from the confines of the Glenquoich Forest and smiled. My little, water logged, faint track had finally hit solid ground and I knew I had good walking ahead of me to Invergarry. Picking up the Great Glen Way I coasted on smooth tracks alongside Loch Oich, then Loch Lochy and soon picked up the Caledonian Canal all the way to Fort William. The day eased both my tired legs and seemed suitable reward for the hard hiking. In retrospect, slipping in the word ‘Wrath’ in a trail name is, for this route at least, very appropriate. Dare you not incur the wrath, do not tempt the anger of this little corner of Great Britain. But if you do, treat it with respect and the rewards will stay with you for the rest of your life. Next, onto the West Highland Way.